If you’re looking for an unusual garden theme, and one that is especially fun for children, perhaps you could plant a primitive plant garden. Prehistoric garden designs, often with a dinosaur garden theme, utilize primitive plants. You may be wondering what are primitive plants? Read on to learn more about primitive plants and how you can go about creating a prehistoric garden with your children. Many plants are available for use in prehistoric gardens. Prehistoric garden designs simply use plants that have existed for millions of years. These plants have adapted to a range of climates and conditions and remain viable today, often reproducing from spores, such as with ferns. Creating a prehistoric garden in the shade is a great way to use this variety of plants. Among the oldest plants found in fossil records, ferns have adapted to climate changes and sprung up in new locations across the planet. Mosses should also be included when planning prehistoric garden designs in the shade. Elevate some containerized ferns on pedestals for an interesting variation. Ginkgo trees and cycads, like the sago palm, are other primitive plants that take more sun and can also be used when creating a primitive garden. The steps for creating a prehistoric garden are similar to creating a traditional garden, but you’ll find the results surprisingly different. Creating a prehistoric garden can help you get the kids interested in gardening since many of them love dinosaurs. A primitive plant garden is easy to design when you’re working with an area that includes both sun and shade. This is a great way to get the kids involved in gardening projects; just tell them they’re planting a dinosaur garden theme. Explain that these foliage plants were likely the dinosaur’s food source all those centuries ago. 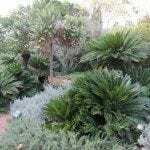 In addition to those listed above, queen palms, asparagus ferns, gunnera, junipers and pine are among plants you can use when planning prehistoric garden designs. Horsetails are another primitive plant you can add when planning a primitive plant garden. Sink a container into the soil for rapidly spreading plants such as these. This allows you to use the plant in your garden and keeps it from getting out of bounds. Don’t forget to add some hardscape sculptures, such as the dinosaurs, that once dined on these ancient plants. Add a sandbox for the kids with, of course, plastic toy dinosaurs to expand on the dinosaur theme when creating a prehistoric garden with children.